Tag Archive | "Hypsophrys nicaraguensis"
The Nicaraguense Cichlid (Herichthys nicaraguense) correctly identified as Hypsophrys nicaraguensis, is endemic to the Atlantic slope of Central America from the San Juan drainage, including Lake Nicaragua (in Costa Rica and Nicaragua), to the Matina River drainage in Costa Rica. 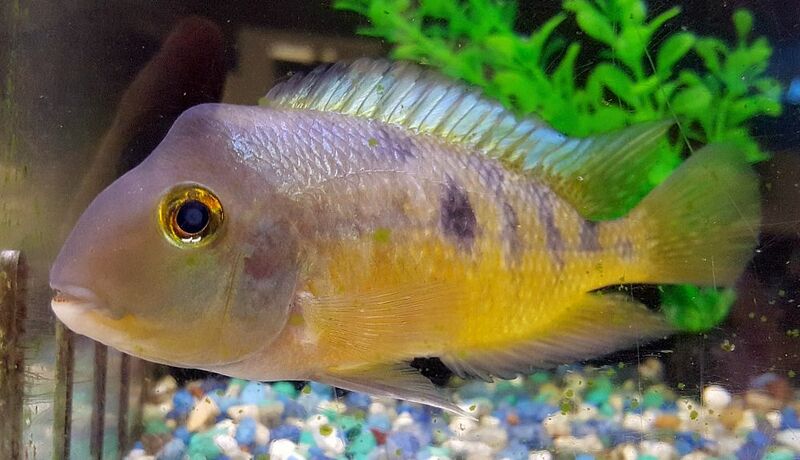 The Nicaraguense Cichlid is also known to tropical fish keeping enthusiasts as the Moga, Parrot Cichlid, Nickie, Macaw Cichlid, Butterfly Cichlid and Nicaraguense. Nicaraguense Cichlids are found in lakes and in rivers with slow to moderate water movement. Although juveniles eat mainly aquatic insects in the wild; adults prefer feeding on seeds, leaves, snails, bottom detritus, and small mollusks. The Nicaraguense Chiclid is a stocky, compact species with an extremely curved head and a downward positioned mouth. Their bodies are a gold to copper color, with an iridescent greenish blue head, a dark line that runs along the middle of the body, and a large dark black splotch in the center. The fins are covered with numerous black spots with the dorsal fin edged in red. Males have a dark edging on their scales that give them a reticulated appearance. Males are larger than the females, have a much more pointed dorsal fin, and develop a hump on their head which often becomes permanent in aquarium specimens. Females are generally more brightly colored than the males. Several color variations exist that are dependent on where the specimens are collected from. Wild caught specimens are always more vividly colored than captive bred specimens. 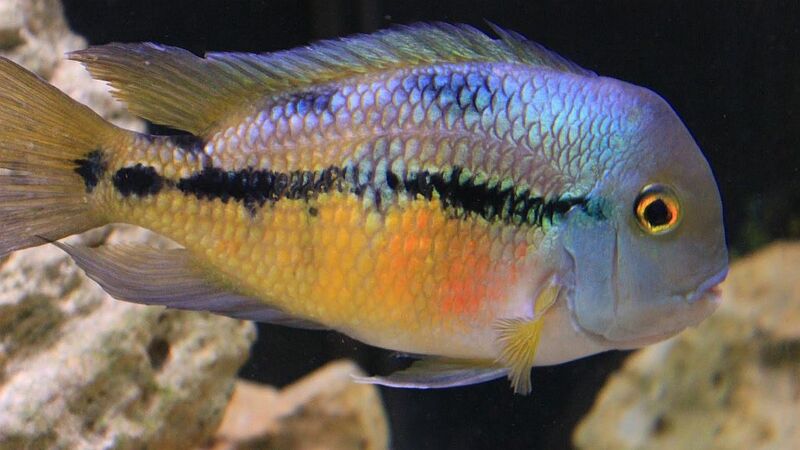 Nicaraguense Chiclids have been known to cross breed with Convict Cichlids (Amatitlania nigrofasciata) with the offspring being fertile for at least 4 generations. The Nicaraguense Chiclid is a relatively peaceful species that require at least a 55 gallon aquarium with a sand or fine gravel substrate, plenty of rocks and pieces of slate formed into caves, and some driftwood for them to hide among. Some hardy well rooted or potted plants should also be included. These fish need a good filtration system with good water movement to keep them healthy. Canister filters are a good choice for these fish. Because they are intolerant of nitrate and phosphate build ups and sensitive to pH changes; they require weekly 20 to 25% water changes, especially if housed in a species tank or with other cichlids. Nicaraguense Cichlids are diggers and “pit spawners”. During spawning, they will occasionally eat any soft leaved plants in the aquarium, so it’s a good idea to decorate the tank with only hardy plants. Nicaraguense Chiclids are egg layers that in the wild spawn in pits that are fanned out of the substrate. The best way to develop a pair is to raise a group of juveniles together and allow them to pair off naturally. In an aquarium environment, even though they are pit spawners, it is best to set up a number of caves and hiding places for the pair to deposit their eggs. Unlike cave spawners whose eggs are adhesive, their transparent eggs are non-adhesive and will lay in a loose conglomeration of clusters in the bottom of the cave or in the pit that they fan out. The eggs are only about 1/16th of an inch in diameter and will hatch out in about 3 days in water at a temperature of 79° F. The small larvae become free swimming in about 4 to 5 days and can immediately be fed newly hatched brine shrimp. Nicaraguense Chiclids are good parents, so the fry can be left with the parents who take turns caring for both the eggs and the young. Nicaragua Cichlids are omnivores that will generally eat all kinds of live, frozen, flake, and freeze dried foods. A high quality cichlid pellet diet supplemented with blood worms, snails, chopped earthworms, brine shrimp, mysis shrimp and vegetables such as blanched spinach or zucchini will keep them healthy. Feed them several small portions a day in lieu of one large portion, and avoid giving them warm blooded animal meats like beef heart or chicken. Nicaraguense Chiclids are available online and from most tropical fish keeping shops as juveniles and adults. They are usually moderately priced unless purchased as wild stock.